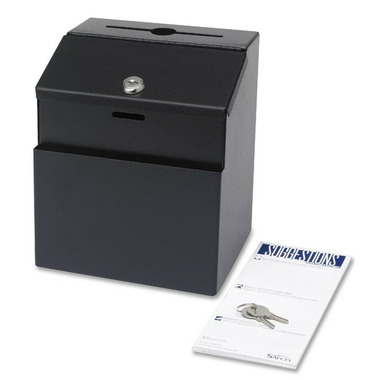 Locking, steel suggestion box invites confidential ideas and comments. Circle cut in 4-3/4" wide deposit slot accepts keys. Front pocket holds blank cards and pen. Box includes pack of 25 suggestion cards, two keys and adhesive labels marked: Suggestions, Comments and Key Drop. Set box on a tabletop or mount to a wall with included hardware. Sturdy steel construction has a powder-coat finish.